As I have said before I got a gorgeous little sewing machine for my birthday this year. I haven't done any sewing since I was about 16 so I have been looking around to buy some cheap fabric and I have sound some cute ones. I have found two cute ones. First up is Dumbo, I loved this film when I was younger and it made me a lover of elephants. While this film is great it is very sad at the same time but if it wasn't it wouldn't be a Disney film would it. I love how Dumbo had really big ears, way too big for his body. 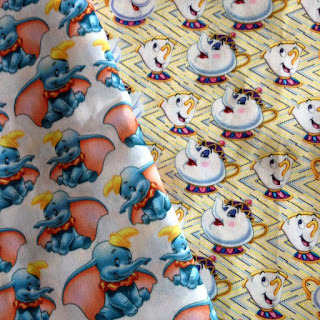 And when I saw this Dumbo fabric I had to buy it and it was so cheap... really cheap. I found it on eBay and when I got it I was so happy with it. The other fabric is this Chip and Mrs Pots design from Beauty and the Beast. Chip has to be one of my favourite characters from this film, he is the cute one in the film and I will always remember when he said 'Mama do I still have to sleep in the cupboard' after he turns into a real boy, I love that bit of the film. Also it's being released as a live action film next year so it's at the front of every Disney mad person's mind at the moment. I saw this bit of fabric and I just had to get it. Chip looks adorable in it and the colour of the fabric shouts of Belle's dress, the lovely yellow. I think I will make hair scrunchies from the fabric as that's what I know how to make at the moment. I will have to show you a picture once I am done making them, it will be once Little Miss P is back at school though.